Illustrated is a page from a 19th century color clothing catalog. The catalog represents the “Spring and Summer 1891” Victorian boy’s clothing line offered by A. Levy & Brothers of New York. 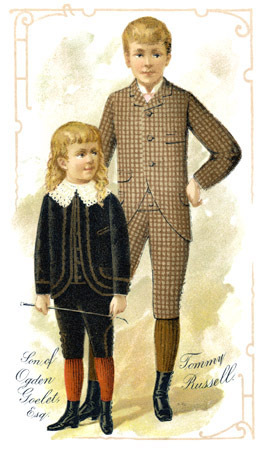 To the right is a Victorian short pants three-piece suit designed for boys ages 10 to 16. The suit is comprised of a jacket, pants and a vest. The material is fine worsted, showing a small check. The suit is principally adapted for the older boy who preferred a vest with his suit. To the left is a Victorian short pants three-piece suit for boys ages 4 to 9. This suit featured a vest or an imitation vest. This style was popular for the smaller boys who wished to wear vests with their suits like their older brothers. This suit was available in the cheapest grade to the finest grade fabrics, including velvets, tricots, corkscrews, worsteds, cashmere and cheviots.